Sort of gave the trick in the title. Inserting Youtube videos in Joomla 1.6 or Joomla 1.7 (sort of our flag systems along with WordPress), the only thing that needs to be done is clear all the filters from the content editors on the articles manager options. So, if the filters get in the way of adding videos, why are they on to begin with? 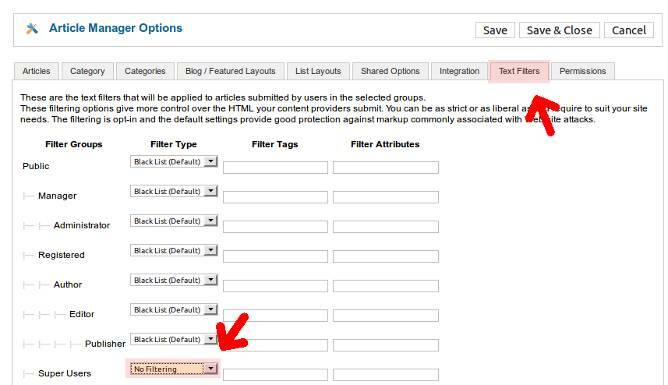 Filters prevent adding malicious or damaging code into the articles of the Joomla website as well as ensuring the output of the code from the WYSIWYG editors is as clean as possible. However, for advanced users or when there are not many administrative users, the filters tend to get in the way. So, if you want to add a video from Youtube, Vimeo, Viddler or even Facebook (see the trick to adding Facebook videos), it is necessary to eliminate the filters from the editors. Embedding videos in Joomla requires a plugin, module or component and that is the method used in Joomla 1.5 series, however, for Joomla 1.6/1.7 there are still no good add-ons that enable this functionality in a simple way. So, for now, to embed videos the next steps need to be followed. Go to Site -> Global Configuration and choose the Site sub menu/tab. 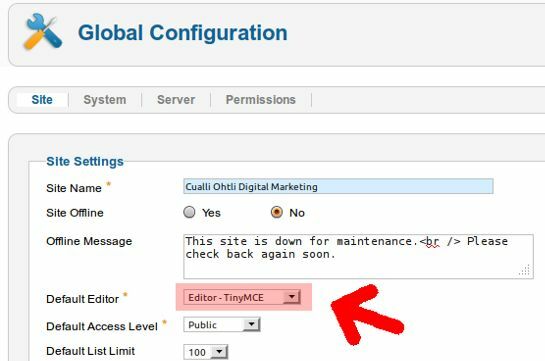 Change your editor* to “No Editor” in the Site Settings area on the “Default Editor” options. 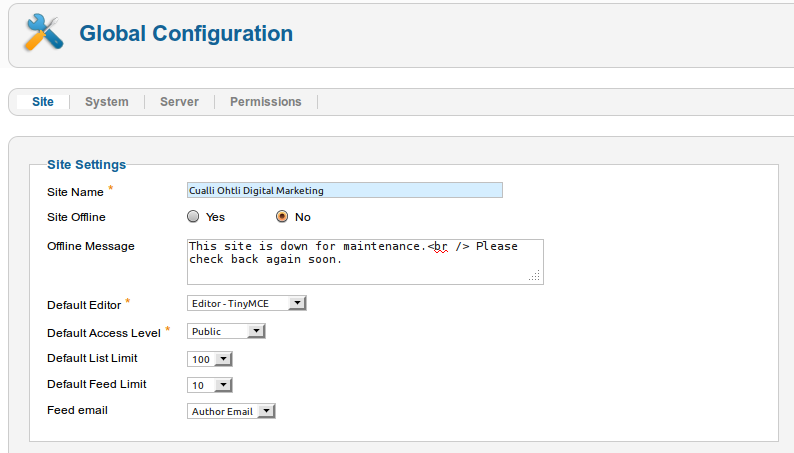 Using the administrator menu go to Content -> Article Manager. On the top right corner of the screen, where the article manager icons are, click on the Options button. A modal window will appear on screen with all the article options. click on the Text Filter tab. Once there, locate the “Super Users” or the users’ group you wish to grant the video embedding option and under Filter Type choose “No Filtering” and then click on Save & Close. Once this is done, it should be possible to add any code into any Article such as videos from Youtube with the regular embedding code. This also works really well with the Artof Editor plugin. Once you are done embedding the videos you can enable the filtering again (be careful not to open and save the articles with the video or they will be filtered again).